In other news, I’ve been bringing back bits and pieces of higher intensity interval workouts (HIIT) over these past few weeks, and my body has been definitely welcoming the change. Of course, my intentions are to avoid overdoing it, so I began with only one circuit-style workout every other week, and now I’m at the place of doing one per week. Even with such spaced out sessions, I still feel like I’m getting some major booty-kicking work done. 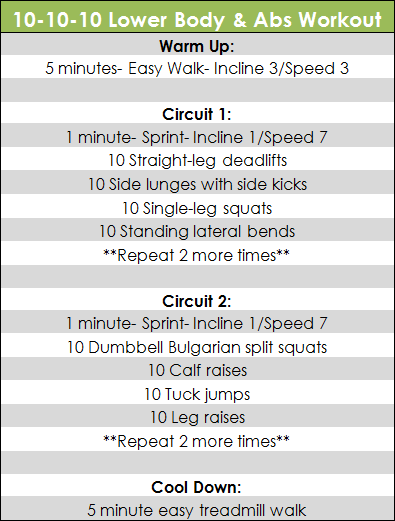 Last week I whipped up a brand new 10-10-10 interval workout to get my head back in the game. Actually, I should have thrown on an extra “10” in the title and called it a 10-10-10-10 workout due to the the added ab exercise at the end of each circuit, but who’s taking notes here? A bit to think about: Are you a fan of HIIT style workouts?